10 Fun Stuff: Unions, Clubs, Outdoors, Activities, etc. with the first probably the most popular. There is a free ATM for members of both banks in Ingraham Hall next to VV. Despite being settled in the middle of the country, there are a ton of restaurants in Madison – Indonesian, African, Italian, Himalayan, Laotian, Bakeries, Brew Pubs, Coffee Joints, you name it -- and everyone has their favorites. The biggest resource for finding food (and entertainment!) in Madison is probably the Daily Page (the online version of our local paper, the Isthmus), where you can search local restaurants by name, locality, and cuisine. There, they have reviews, hours, contact info, pricing, etc. Be sure to peruse their Madison's Favorites section for some quick tips! Ingraham Hall: Not as good and not as cheap, but very close to Van Vleck, and has acceptable coffee (bring your own cup to save money!) and decent snacks. Try the lunch special: sandwich and 4 sides (soda, fruit, cookies, etc.) for five bucks. The local foods are beer, ice cream, cheese, and brats (say hello to your new-found Wisconsin-love-handles). Each year Madison hosts Bratfest, a record breaking event. UW has Babcock Hall Ice Cream on campus which creates delicious ice cream available in the Unions. Other great local places to hit are the Chocolate Shoppe (which has also experimented with soy creams) and Michael's Frozen Custard. Local breweries include the Great Dane, Captial Brewery and Ale Asylum. You could also take a trip out to the New Glarus Brewing Co-- camp out in the New Glarus Woods State Park and take the tour of the brewery while you're there. In early September (2nd-3rd), check out Taste of Madison to see many restaurants all in one place at one time. Try a good ol' midwestern Fish Fry on Friday night – All you can eat fried fish generally served with a bran muffin, clam chowder, or coleslaw. Most Brew Pubs and some churches have them, and the Orpheum has a particularly tasty fry. During the summer and fall, you can wander out to one of the many local farms. Grab some friends and drag them along to a U-Pick farm while strawberries, raspberries, apples, or pumpkins are in season -- the distance can detract, but the produce is much cheaper when you pick it yourself. Aldi Foods: CostCo-esque in inventory and pricing, but not restricted to bulk items. It's like grocery shopping at Overstock.com. Capitol Centre Foods: If live downtown and have no ride then try here. It's small and a little more expensive, but they deliver. CostCo: A little out of the way, being in Middleton, but cheap. They sell stuff in bulk - three packs of mayonnaise, 50 oz bottles of shampoo, 17 lbs of sockeye salmon - you get the picture. You'll need a membership if you choose to shop there, though - about $50/year. Cub Foods: Family size packs of everything! Walgreens: Pharmacy/Grocery store. In a pinch, it will do (no produce though). There is a Walgreens on the corner of Lake & State Street near Van Vleck, and on the Capitol Square. Whole Foods: Kinda spendy, but good bread, specialty stuff, and produce through the winter. Woodman's: two locations -- East and West. If you have a car and the time, go here. Very large, very cheap, but time consuming. They don't take credit cards, so bring a debit card or check book. The produce is pretty poor, but they're huge and, again, cheap. Check out the liquor store for a large selection (you can buy all types of alcohol in grocery stores in Wisconsin... but not after 9pm). Madison is particularly Co-op-friendly town. Besides being good places to get groceries (produce in particular) in a friendly atmosphere, they also do a lot to give back to the communities. Some offer free cooking classes and send out newsletters to their members. Join to save money, get involved, and help to keep them going. Regent Market Cooperative, 2136 Regent St. 233-4329... a little off the beaten path, but goto if you're in the area. Willy Street Co-op The largest and most active co-op in the Madison area. If you like organic and fair trade foods, then this is the place to go. They also offer a large selection of bulk foods and spices, as well as fresh fish and deli meats. For a quick bite, they have a deli, salad bar, and in-store coffee shop. 1221 Williamson St. 251-6776. Dane County Farmer's Market: Not a grocery store, but definitely check this out! On the capitol square on Saturday mornings April–October from early to noon. Everything had to have been produced in Wisconsin. Great for meats, eggs, CHEESE, produce, breakfast, and just about anything you could ever want – except milk. Great place for Cheese curds! Trader Joe's: A specialty grocery store originating in California, now located at 1810 Monroe St. Unlike most specialty stores, they do have most things that any grocery store would. Though they aren't exactly cheap, they do have much lower prices for what they provide than most other places. Off-Campus Housing Search: Probably the best search site for students. University Apartments: On campus graduate housing, particularly popular with married couples (especially with children). Singles are also welcome. Many of them are on the bus rout #80, a free route which runs from the apartments through campus every fifteen minutes throughout the day. Graduate students tend to clump in their housing. The best areas are just a bit away from campus, far away enough to be out of the undergraduate mayhem, but still close enough to keep the commute down. The Vilas neighborhood, just south of VV between Park and Monroe north of Lake Wingra, is a great example of a good grad student filled neighborhood. East of the Capitol building, we also have the Willy St. neightborhood (between Williamson and Rutledge streets, between Paterson and Thornton) and the other side of the Isthmus (between Mifflin and Lake Mendota, no closer than Blount and no farther than Baldwin). A little farther out, there is also Sheboygan Ave, which includes Normandy, Chapel Hill, Carolina, Monticello, Hilldale Towers, Park Towers, and Sovereign Apartments on the near west side. Here is an approximate map of good areas (with local grocery stores!). 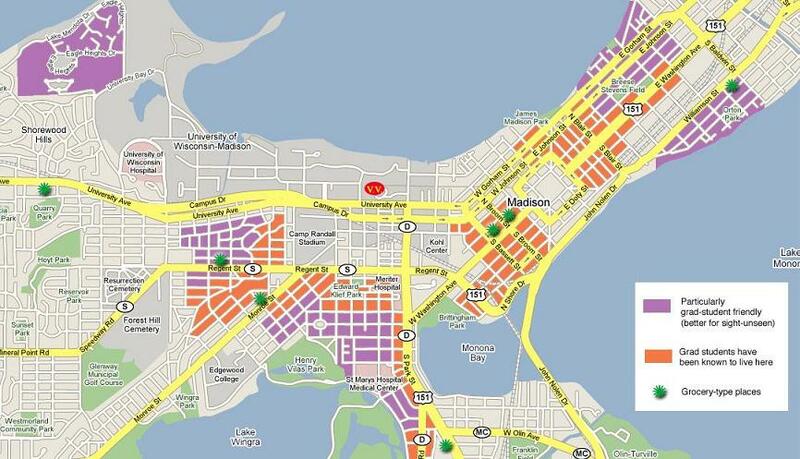 Basically, shoot for zones 4 and 6 on this map (the map from the UW Off-Campus Housing Search). Biggest guideline: stay close to campus or a busline (don't plan to park on campus). You will receive a free bus pass for the Madison Metro system which is very reliable. Check out the “plan your trip” link to find bus routes near you. The Todd Drive Area: Just west of park street on the beltline. American Furniture for furniture and electronics, Home Concepts for cheap but nice looking furniture, and Steinhafel's for furniture and mattresses. Fun Stuff: Unions, Clubs, Outdoors, Activities, etc.